You'd probably recognize the Pilates reformer even if you've never used one. It's a hulking machine that consists of a sliding carriage rigged with springs, bars and straps. On this apparatus, you lie, kneel, stand and sit to create a balanced body and strong core — or "powerhouse," as creator Joseph Pilates called it. The reformer may look like another fitness fad, but it's endured since the early 1900s, when Pilates first cobbled a version together for bedridden patients to exercise, despite their illnesses. The reformer kicks up the positives a Mat Pilates program provides, including better back health, flexibility and body awareness. Regular reformer workouts offer other unique benefits, too. The reformer offers all of these Mat Pilates core-building benefits and more. The resistance of the pulley and spring system offers more resistance than what you get with just your body weight on a mat. You'll achieve even better posture and coordination than you would with a Mat or classic fitness core routine. The bars and cables of the reformer guarantee you'll move your body through a full range of motion — something you might not be able to do on your own. When you hold the cables at your arms or fix the cables to your feet, you can't help but extend to the fullest to follow their track. When doing exercises alone without such guidance, it's easy to fall back into old patterns of movement that aren't as beneficial. You might habitually bend your knees or elbows, for example. You may hear that Pilates lengthens the muscles, which isn't really possible. What it does do is give you the appearance of greater length because you find this full range of motion and train to maintain it day in and day out. You'll look taller, slimmer and sleeker as a result of regular reformer work. While Mat Pilates does include some exercises that train your arms and legs, they're usually done with no — or very light — resistance. The reformer works your arms and legs more thoroughly, providing a more comprehensive workout. The resistance of the reformer means you'll get results from your workouts faster. The tension of the springs on the moving carriage adjust to different levels of difficulty. 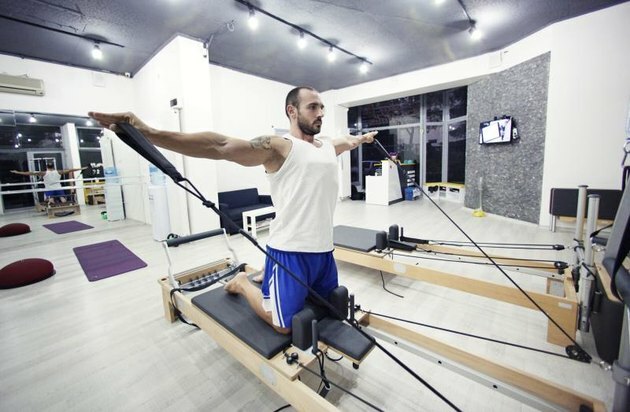 As you become stronger and more proficient with the reformer, you progress from reclined exercises to ones that put less of your body surface on the carriage, meaning you need to use more of your own strength and coordination to execute the moves. You may even notice greater definition in your arms, legs and abs after just a few months of consistent work on the reformer. What Is the Activia 14-Day Challenge?